Liberal Democrats in the House rejected a bill that would end a redundant Environmental Protection Agency (EPA) permit requirement to spray federally approved pesticides into bodies of water to combat the mosquito that carries the Zika virus. Rep. Bob Gibbs (R-OH) argued on the House floor in support of his Zika Vector Control Act (formerly the Reducing Regulatory Burdens Act). He said the additional EPA permit requirement for pesticide spraying under the Clean Water Act is redundant since the pesticides are already approved under the Federal Insecticide, Fungicide and Rodenticide Act (FIFRA). “Protecting communities from Zika and other mosquito borne diseases has become difficult thanks to a burdensome and duplicative federal regulation that requires more time and money spent on compliance rather than protecting the health and safety of the American people,” Gibbs said, reports CNSNews.com. [C]ompliance costs and fears of expensive litigation associated with the requirements are forcing states, counties, mosquito control districts and other pest control programs to reduce their operations and redirect resources in order to comply with the regulatory requirements. House Democrats condemned the measure. The bill failed 262-159, with at least one member – Rep. Jim McDermott (D-WA) – comparing it to giving an allowance for the spraying of Agent Orange, an herbicide used by the U.S. military during the Vietnam War. This does nothing about Zika. It doesn’t do anything with the research that the president has asked the money for. What it does simply is turn the applicators and the pesticide manufacturers loose on this country again. I’ve been here long enough to remember all the problems with the bird eggs that had soft shells, and the birds were dying, and we couldn’t have all these animals dying all over the place because of DDT and all the things that happened with that kind of application freely in the society. 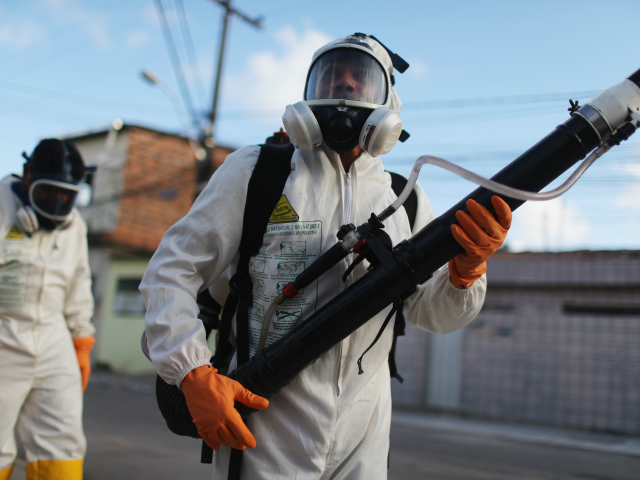 However, as Breitbart News reported, the director of the National Institute of Allergy and Infectious Diseases (NIAID) says that during the 1950s and 1960s, Brazil successfully eliminated the mosquito carrying the Zika virus through the use of DDT. Rachel Carson … in her 1962 book, Silent Spring, made an eloquent case that DDT was endangering bird populations. This was false. In fact, by eliminating their insect parasites and infection agents, DDT was helping bird numbers to grow significantly. No matter. Using Carson’s book and even more wild writing by Population Bomb author Paul Ehrlich (who in a 1969 Ramparts article predicted that pesticides would cause all life in the Earth’s oceans to die by 1979), a massive propaganda campaign was launched to ban DDT. The CDC says the mosquitoes carrying the Zika virus will move into much of the United States this summer. Currently, the agency says 157 pregnant women in the United States have tested positive for the Zika virus. The agency is recommending Americans “use an outdoor flying insect spray where mosquitoes rest” as a means to control the mosquitoes carrying the Zika virus. Inside the home, CDC suggests keeping doors and windows closed and using an indoor flying insect fogger or spray such as those containing Tetramethrin or Imidacloprid. Planned Parenthood and its colleagues in the fetal tissue business have latched onto the message that Zika is an urgent crisis and have contrived a message to meet its own agenda. #ZikaVirus is a public health emergency. The immediate response must include access to family planning, education, and counseling services. A special House panel investigating the fetal tissue practices of Planned Parenthood is also scrutinizing StemExpress, the primary biomedical company that has engaged with the abortion business in the transfer of the body parts of aborted babies. The Washington Post reports that StemExpress named Zika as one of the reasons it requires fetal tissue procurement.